I recently discovered this great online tool HTMLPen.com and I’ve been using it for a couple weeks now and I’m already in love. 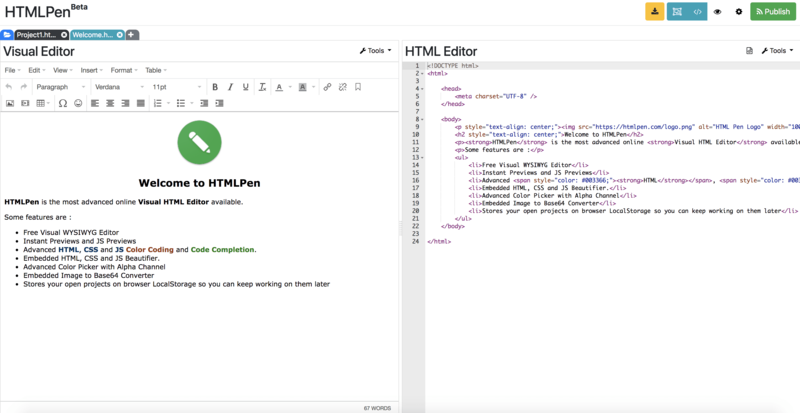 HTMLPen is an online Visual HTML Editor (WYSIWYG Editor) that offers great visual design tools and great code editing tools in the same page. It offers instant previews, has code completion for HTML, CSS, and JS, it is code aware so it color codes HTML, CSS, and JS, has a great color picker that supports alpha channel, and has the easiest Base64 image converter that I’ve ever seen. Aside from the tools, it is also possible to edit multiple files at the same time, open files from your drive, save it on your browser local storage, and you can keep working on it later from where you left off. I really hope that you also like it. Tell me about it in your comments.